I still remember the summer before going into the third grade (it was 1981). 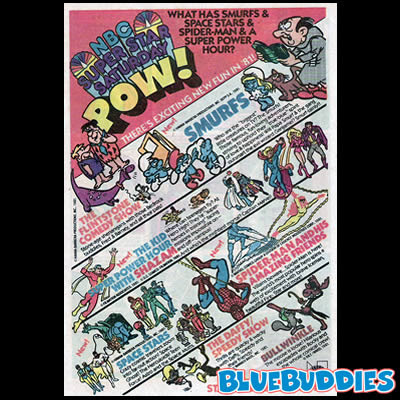 I was looking at the comics section in the Sunday newspaper and found a full page color ad for the upcoming Saturday morning cartoon lineup on NBC. One of the new shows was called The Smurfs. I don't know what it was, but at that moment I connected with the little blue people staring back at me from the paper. I couldn't wait for September to roll around and learn more about the Smurfs. It didn't take long for eight year old Kevin to become addicted. Six months later when I turned nine I had a Smurf themed birthday party which included an ice cream cake with a Smurf artistically added to the top. 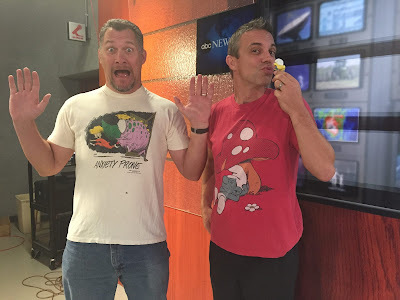 Gifts included Smurf t-shirts, ColorForms and stuffed animals. I had dozens of the little rubber figures by then too. Hardee's had released a series of Smurf glasses a couple years later and I had them all. Again I was addicted. I watched their many adventures week after week and even forced down several bowls of Smurf Berry Crunch cereal (I wasn't crazy about the cereal). Clumsy was without a doubt my favorite. 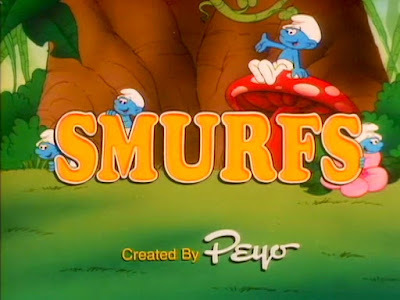 But I also loved Papa Smurf, Brainy and Smurfette. 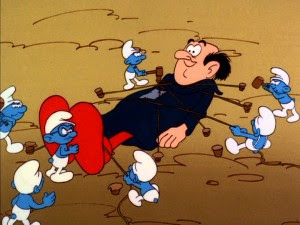 I cheered when they overcame the underhanded tactics of Gargamel, Azrael and Hogatha. Somehow they escaped danger in both episodes that aired each Saturday morning. The one episode that stands out to me the most aired on Halloween 1981. 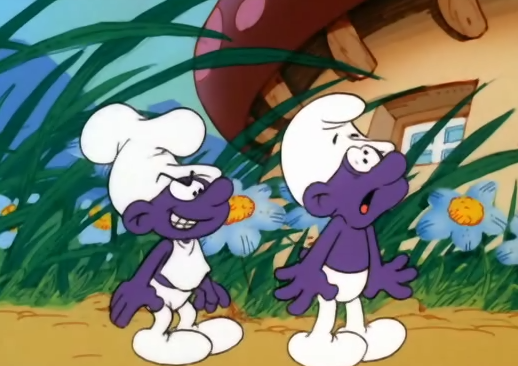 The Purple Smurfs told the story of a how the happy blue Smurfs turned angry and purple after a bug bite spread like wildfire. It was a zombie apocalypse of Smurfy proportions. Just as it seemed as if the end was in sight for the Smurfs, the day was saved and everyone returned to the happy Smurfy selves. Even into adulthood I held onto those Smurfy memories. I kept my collection of toys and even added to them after graduating college, scoping out yard sales, flea markets and thrift stores. Then in 2011, the tiny characters overtook the big screen. New merchandise was released and I added to my already out of control collection.